It may not have been Greenpeace’s intent, but there is ample precedent to suggest that the arrest of unarmed protestors who have galvanised the public’s attention rarely works in the interests of the arresting powers. activists then attempted to scale the rig. Alerted, the Russian coast guard rammed the rafts that surrounded the Greenpeace vessel, the Arctic Sunrise, firing warning shots over the boat and shooting the activists with water cannons. Much of the international discussion about the incident so far has revolved around legal issues. Much of it has focused on interpretations of the U.N. Convention on the Law of the Sea — about the applicability of the charge of piracy and of the legality (or otherwise) of the Russian coast guard’s boarding and seizure of the Greenpeace vessel. Many, obviously, have contested the validity of the piracy charges. Whatever their legal or moral status, these actions are not without precedent. In February, a U.S. Court of Appeal upheld a conviction of piracy against anti-whaling activists, although it must be said the tactics of these activists were substantially different from that employed by those on the Arctic Sunrise. 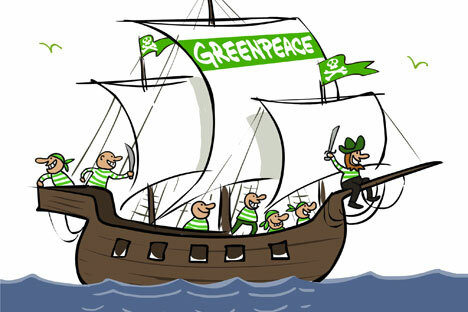 including the sinking of Greenpeace’s Rainbow Warrior by the French intelligence agency in 1985. But if there has been disagreement about the legal or ethical facts here — or their interpretation — there should be less debate about the incident in terms of public perception. The sight of unarmed activists held at gunpoint and then charged with an offense that carries a possible 15-year prison sentence, might have the effect of drawing attention to what many believe to be an issue of crucial public concern. It may not have been the intent of the Greenpeace activist, but there is ample precedent to suggest that the arrest of unarmed civil disobedients who have galvanized the public’s attention rarely works in the interests of the arresting powers. Whether that turns out to be the case here remains uncertain. Chris Fleming is a senior lecturer in Humanities and Communication Arts at the University of Western Sydney.